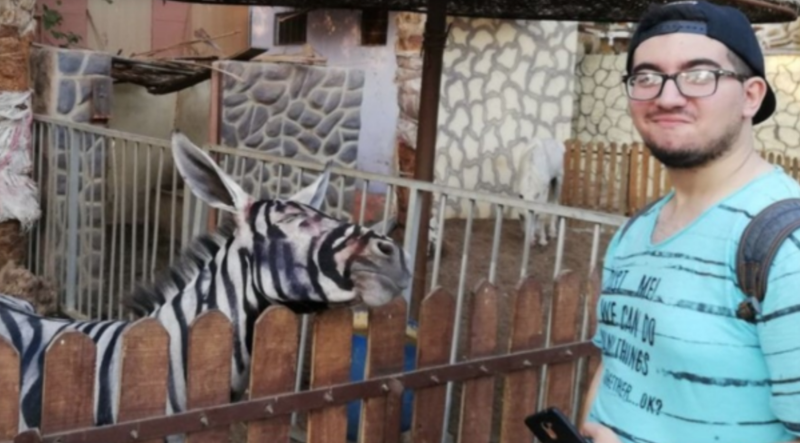 The BBC reported on Thursday that a zoo in Egypt has denied painting black stripes on a donkey to make it appear more zebra-like after a student posted photographs of the creature online. The student, Mahmoud Sarhan, posted the images on Facebook shortly after visiting Cairo’s International Garden municipal park, and soon his post had gone viral. Local radio station Nogoum FM got in touch with the zoo’s director, Mohamed Sultan, who persisted in claiming the animal was indeed a zebra and no fake, the BBC reported. But a vet who spoke to local news group Extranews told the outlet that unlike this zoo specimen, actual zebras have black snouts and parallel, consistent stripes. Anyway, I don’t see what’s wrong with dressing up your animals-in-captivity for a little extra pizazz, after all, budgets are tight and zoos are already unnatural zones. Enjoy the tricksy stripe-donkey and $36 Dippin’ Dots—these are what memories are made of.